At Palo Alto’s Gamble Garden this morning, two sort of familiar plants — a big upright succulent just coming into bloom, a small tree (or large shrub) with silver-green leaves and still green berries. The first a new (to me) variety of the familiar spectabile species (‘Autumn Fire’ rather than ‘Autumn Joy’ — hey, fall is coming fast), with a unfamiliar (to me) genus name (Hylotelephium instead of Sedum). 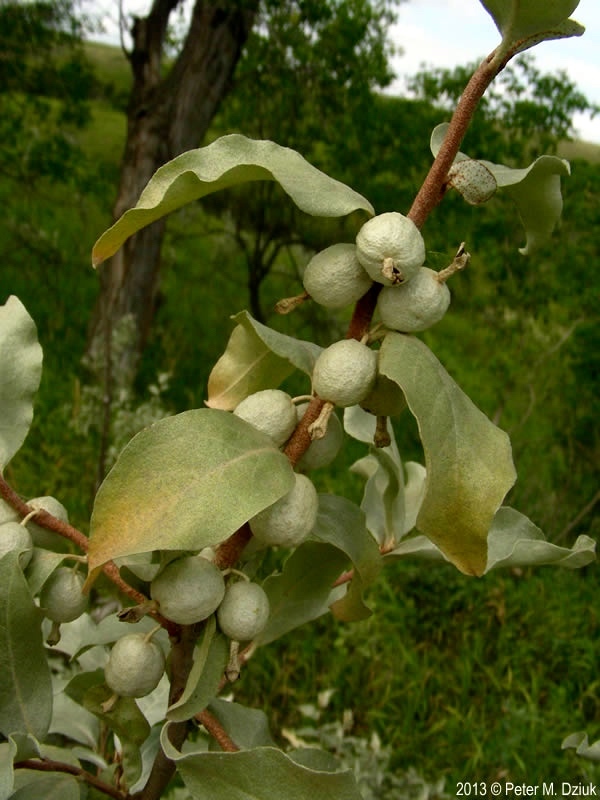 The second both like the familiar olive (Olea europaea) and like the familiar Russian-olive (Elaeagnus angustifolia), but not quite either of them: a merely olive-like Elaeagnus rather than an actual Olea, and commutata ‘silverberry’ rather than angustifolia. 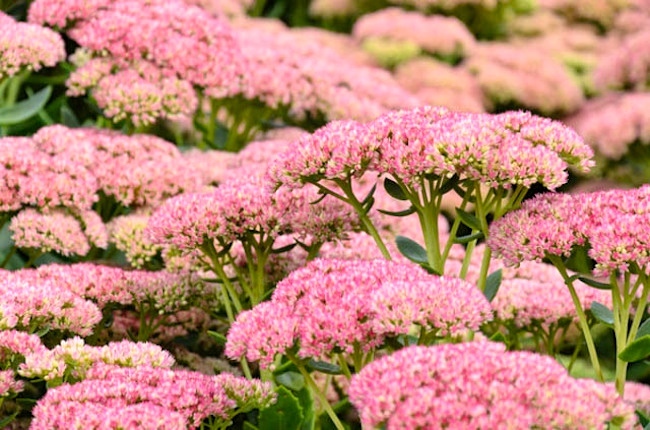 Hylotelephium spectabile (formerly called Sedum spectabile) is a species of flowering plant in the stonecrop family Crassulaceae, native to China and Korea. 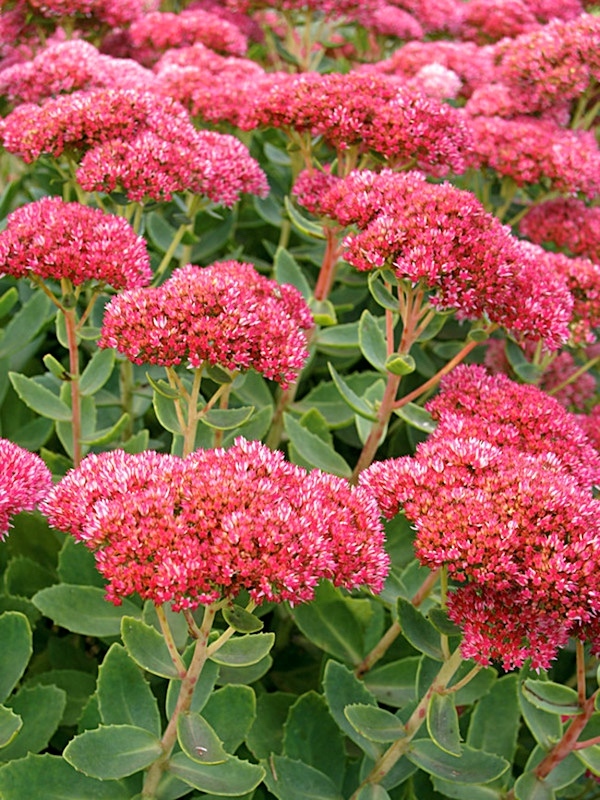 Its common names include showy stonecrop, ice plant, and butterfly stonecrop. Growing to 45 cm (18 in) tall and broad, it is an herbaceous perennial with alternate, simple, toothed leaves on erect, unbranched succulent stems. The star-shaped pink flowers are borne in flat cymes 15 cm (6 in) across, in fall (autumn). The specific epithet spectabile means “showy”. This plant is valued in cultivation as drought-tolerant groundcover. Numerous cultivars have been produced. The taxonomic status of this sedum has been a matter of some dispute; officially, it’s now in a genus of its own, rather than subsumed under the genus Sedum. Elaeagnus commutata, the silverberry or wolf-willow, is a species of Elaeagnus [in the family Elaeagnaceae, the oleaster family] native to western and boreal North America, from southern Alaska through British Columbia east to Quebec, south to Utah, and across the upper Midwestern United States to South Dakota and western Minnesota. It typically grows on dry to moist sandy and gravel soils in steppes, meadows or woodland edges. The species is cultivated as an ornamental plant for its silvery foliage. Both the fruit and seeds of this plant are edible either cooked or raw [apparenty, it’s especially good in pies]. The fruit is very astringent unless it is fully ripe. The fruit is a very rich source of vitamins and minerals especially A, C and E. As well it is a fairly good source of essential fatty acids[, which] are rarely found in fruits. This plant, like legumes, is able to fix nitrogen. 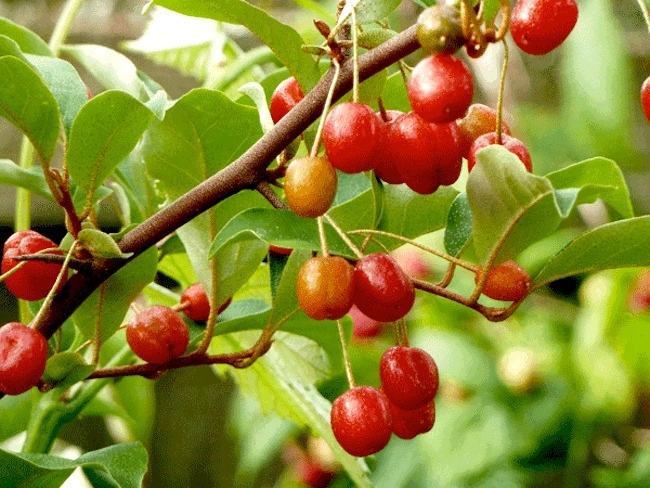 When grown in orchards as a companion plant, it has been documented to increase fruit production by ten percent. Traditionally the fibrous bark of this tree has been twisted to make strong ropes, and woven into clothing and blankets. This entry was posted on August 6, 2018 at 1:53 pm and is filed under Language and plants, Names, Taxonomic vs. common. You can follow any responses to this entry through the RSS 2.0 feed. You can leave a response, or trackback from your own site.